Food Costs > How Much Do Crepes Cost? How Much Do Crepes Cost? 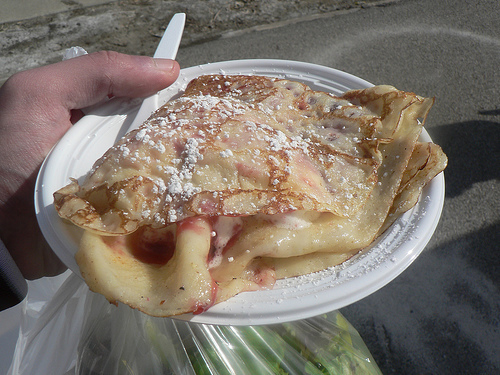 Crepes are a very thin pancake that can be eaten alone or can be filled with a fruit and/or cream. Although many countries have its own versions of this delectable French pancake, crepes are almost always associated with Paris. After all, crepes originated in Brittany, a western region of France, where its tools and techniques were designed and perfected to the point that crepe making has become an art form. Crepes were traditionally made of buckwheat, which was an easy-to-grow plant at the time. The farmers did not use white flour at that time because it was a costly product kept only for royalty. But, later on, as they progressed and were able to afford some luxuries in life, these farmers started to make and enjoy the white flour crepes at breakfast or as an after dinner treat. Depending on the filling and where it’s purchased, most crepes at a restaurant are going to cost anywhere from $4 to as much as $9. Like most dishes, some restaurants may include a small side, while others just include the crepe itself. The costs will depend on the choice of filling, where you live and where you plan on purchasing one. At IHOP, for example, the prices are close to $9. The Cheesecake Factory has similar prices as well. Daviswiki.org shares that the average cost of crepes at Crepeville is around $7. A crepe in Paris, for example, is around $4 to $6. Crepes are packed according to your choice of fillings but can also be eaten plain if that is what you prefer. Similar to a thin pancake, a crepe is made of flour and can be served with just about any filling you can think of. Crepes can be made to order and prepared either crispy or soft, depending on the customer’s choice. Some crepes, when purchased at a restaurant, will be served with sides, such as hash browns, toast, eggs, or other breakfast foods. During the cooking process, a liquid batter is thrown onto a hot frying pan. After being filled with a filling, the thin wheat layer will then be wrapped around the filling. This type of dish can be eaten for breakfast, lunch, dinner, or even dessert. The most common ingredients include eggs, milk, butter and flour. The average plain crepe will have about 112 calories, 45 percent fat, 39 percent carbohydrates and 16 percent protein. This number will increase as you add various fillings, so it is hard to offer an “exact” number. Depending on the seller’s billing policy, you may have to pay more for the type of filling you desire. According to some sources, a sweet crepe is cheaper compared to one with a ham and cheese filling. Usually, these premium ingredients will increase the costs by $1 to $2. In the early days, crepes were basically a dessert in Paris and southern France and served were only served in fine restaurants. The French used to celebrate crepes every second day of February to commemorate the return of the light, or spring when there were no more long winter nights. Today, there are several versions of a crepe. In Italy, for example, they have crespelle, the Chinese has a Mandarin pancake, the Hispanics have a tortilla, the Indians have a dosa, and lastly, the Russians have blinchki. Learn how to make crepes and prepare your own recipe at home. With very few ingredients, it doesn’t cost much to make one at home and there are many easy crepe recipes available online. If you’re frugal enough, you can make one for less than $2. If you do plan on going to a local restaurant, look for coupons or at daily deal websites to see if any deals are active.